The Web Value Investor » Ultimate Buy Signal for RIM? Sir Templeton earned his wings as a legendary value investor by borrowing $40,000 from his boss during the nadir of the Great Depression and using it to purchase shares of every single company trading under $1. The rest is history. These days the legends have different names, like Prem Watsa, who already owned a significant stake in RIM and then went ahead and doubled down. 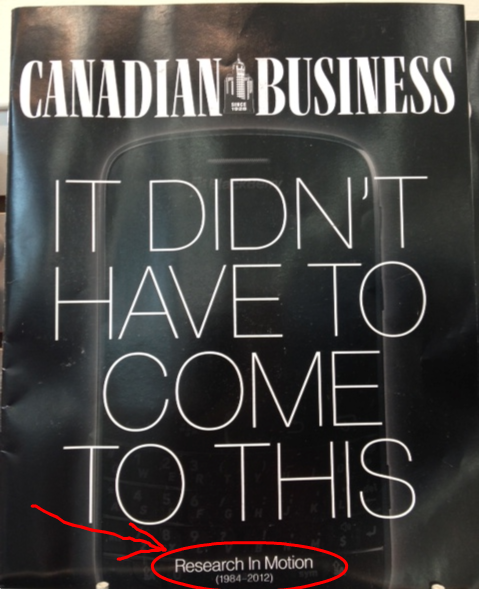 So I couldn’t help but notice this Canadian Business cover story when I was out shopping yesterday. Could this be RIM’s specific equivalent of the now, legendary “Death of Equities” Newsweek cover of 1980 which heralded the kickoff for the longest, strongest bull run in history? One of my core tenets, not only in investing but everywhere, is that whatever the consensus opinion is, especially among experts and paid prognosticators, is usually the one outcome which is precluded from actually occurring. It doesn’t help me predict what’s going to happen, but it helps me rule out what probably won’t happen and sometimes that is enough to get you a few degrees of edge in one direction or another. Some of the smartest investors I know think RIM is stupid cheap, and if you have the patience to wade through 122 (and counting) pages of point/counterpoint from some of the brightest personal investors I’ve seen, then checkout this thread on my favorite value investing forum. I have not yet looked at RIM sufficiently to justify going in myself, but I will be making time to take a much closer look over the next few weeks. I will post any further thoughts here. One thing I do like about it is that they took the new CEO from inside the company, which usually where successful turnarounds come from. Jim Collins (Good to Great, et al) and Jason Jennings (Reinventors) have both done a lot of research which indicates that hiring the rockstar CEO from outside the company seldom works – (Yahoo, take note).